Avengers: Infinity War is only a few weeks away and that is VERY exciting news indeed. Given the close proximity of the movie, there is all kinds of merchandise coming too, from books, to toys, to clothing. The king of movie merch is Funko, and a range of Pops, Dorbz, and Mystery Minis is on the way to celebrate the film's launch. Below you'll find EVERY new Funko Pop, and if you flick over to page 2 of this article you'll find all the Dorbz and Mystery Minis. That is a lot of cute, large-eyed superhero / villain for you to digest. All these collectables are on sale now (in the US - March 17 in the UK), and we've included the cheapest prices for them all. 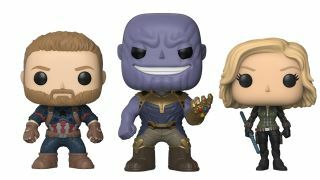 While you're going to want all of them, I'm definitely looking to grab the Black Widow Pop (because it's so cute), and probably the Iron Spider (because Spider-Man Pops look great and tend to be very collectable). It's also great to see the Iron Man 'Hulkbuster' suit here in addition to his regular one, and OHMYGOD is that Young Groot with a gun? He could become one of the rarest, most expensive Funkos around, because fan demand will be huge.